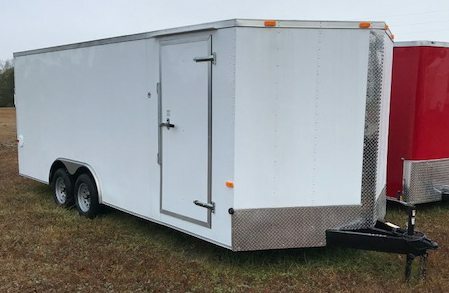 This 6′ x 10′ ′tandem axle enclosed cargo trailer manufactured by Cargo Craft has many, many features that make this trailer an outstanding value. It starts with tubular steel main frames, walls and ceilings, making them the strongest frames in the industry. 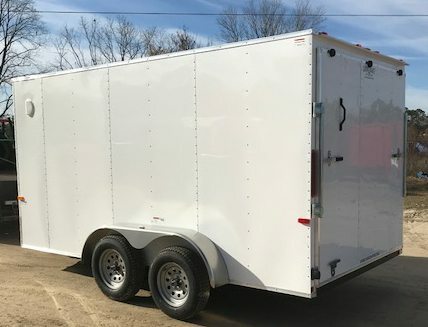 You simply cannot find a better 6 x 12 ft trailer at a lower price. Triple steel tubing is standard on all of our trailer hitches to add peace of mind while hauling that heavy load. Your trailer also has a 32″ side door for easy access and 24″ stone guard to prevent chipping and maintain your trailer’s sleek appearance. The exterior aluminum is .024 thick with a combination of screws and glue for strength and a smoother exterior. All tail lights are LED for brightness and safety. Double doors or ramp doors are standard on all of our trailers. Because this is a top quality trailer, you will get a rock solid, TRUE 3-year manufacturer’s warranty on your trailer. Cargo Craft has been making trailers since 1990 and they stand behind their trailers. To customize your trailer visit our Trailer Options Page. 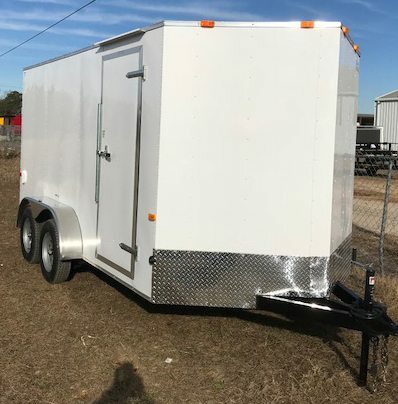 This 6′ x 10′ tandem axle enclosed cargo trailer manufactured by Cargo Craft has many, many features that make this trailer an outstanding value. 32” bar lock side door. and one interior dome light. For all additional options start with EV model pricing. All pricing and specifications are subject to change without notice.